During my recent two month (northern) autumn stay in New York City, I was particularly keen to watch some American college football. I grew up with it, first attending every Rutgers University game with my parents and then later my high school and my respective universities, including my first year at Dartmouth College when the “Big Green” went undefeated. So try looking for college football in New York City; it’s astonishingly hard to find. In fact, New York must be unique in American cities in this way. Los Angeles has UCLA, University of Southern California and a host of smaller colleges and universities with active football programs. San Francisco Bay area has powerhouses UC Berkeley and Stanford, as well as a number of others. Boston has a number (think Boston College, Harvard), as does Chicago (Northwestern). Certainly many of the powerhouse football colleges in the USA are not located in their states’ largest cities, as many are in state universities. But New York is unique: there are, in fact, thirteen different State University of New York campuses with inter-collegiate football programs: Albany, Alfred State, Alfred University, Brockport, Buffalo State, Buffalo University, Cortland State, Erie Community, Hudson Valley Community, Maritime College, Morrisville State, Nassau Community and Stony Brook. But unless I have my geography wildly wrong, none of these are in New York City – and only the University of Buffalo (which is almost in Canada, for goodness sake) actually has a football program of note. Funny, that: think about the surrounding states (all with smaller populations): New Jersey with Rutgers in the big leagues for some years now, Penn State in the “uber” big leagues and even University of Connecticut. So clearly New York is not a college football state: in fact (and I have not read any analysis of this, although it may exist), New York State’s public universities must surely be amongst the least visible state football programs in the USA (did you know that the University of Buffalo was actually a state school?) – although a number of private colleges (Syracuse particularly but also Cornell, Colgate and many others) are reasonably strong. All of which makes watching live (as opposed to television) American college football in New York City a challenge. There are only three NCAA “Division 1” college football teams in New York City: Fordham University, Columbia University (see below) and Wagner College on Staten Island, none of them with football programs of note. It was not always thus: in 1870 Columbia played Rutgers in the second football game in history, and for many years provided high level competition to Rutgers and others. The Fordham teams from the late 1920s through the 1940s were some of the best in the country, appearing in the 1941 Cotton Bowl and 1942 Sugar Bowl. But Fordham dropped its football program in late 1954, only reinstituting it in 1970. In some ways Columbia football sank even lower: from 1983 to 1988 the Columbia football team lost 44 games in a row, still an NCAA record. Makes for interesting reading, doesn’t it? What’s missing? Actually, New York City-based teams are missing. But this city does love sport: think of the most successful baseball team in history, the New York Yankees. And the Mets and the (former) Brooklyn Dodgers; the city has hosted fourteen World Series to date. And professional football: the Giants and the Jets (even if both of them actually play in New Jersey), the Rangers and the Islanders ice hockey teams, the basketball Knicks, the “Red Bulls” soccer. And in fact, New York is unique in the USA in that it has more than one team in each of the most popular professional sports – baseball, basketball, football and ice hockey. But still, no college football of note. 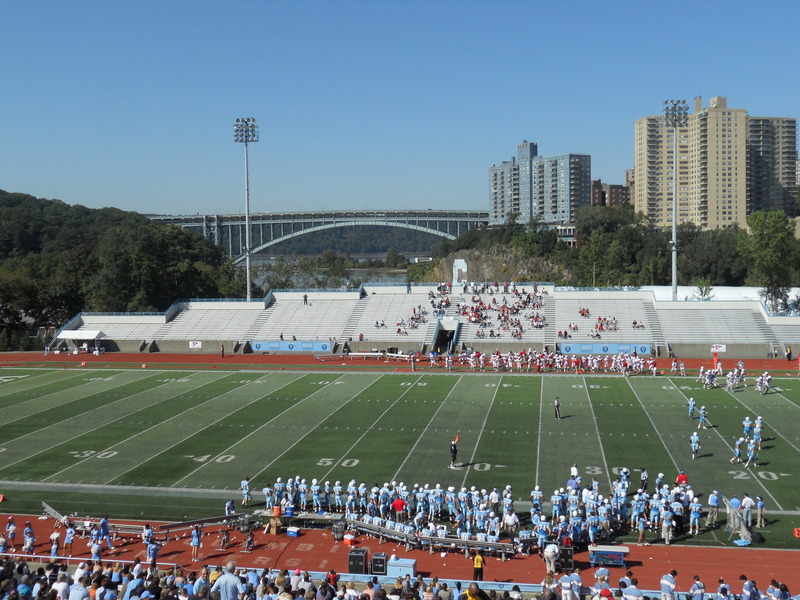 So for that reason on a glorious warm and dry Saturday this autumn, I attended a Columbia University football game at Baker Field at the very top of Manhattan, just below the Bronx. According to the Ivy League football website, there were 3003 attendees, including we three from Australia. The distance from the main university campus (and its somewhat “down-market” location) certainly does not add to the audience appeal. Just take the “1” train uptown – whoops, if it is running on weekends that far north (it wasn’t the day we went; sigh). (Click here for Jake Novak’s hilarious analysis of how to get to Baker Field.) But it only cost $10 to get in (by contrast, University of Michigan general admission prices ran from $70 to $85/ticket this year, and up to three times higher for premiere seats). Columbia lost, although they played their heart out. As football games go, it was low-key: at half-time Columbia fielded a marching band of about 18 (just about as far as you can get from the Michigan or Ohio State hundreds), a band much more notable for its intellectual stunts and outrageous behaviour than anything else. But the football team’s pale blue uniforms looked great against the green Astroturf field, with the Hudson River and the Henry Hudson Parkway toll bridge in the background, set against the steep rising green Palisades of New Jersey in the distance. Columbia’s football team was not bad this year – in fact frequently held the lead in a number of games but somehow managed to lose every one until the season’s end. Columbia had one win and nine losses – curiously beating Brown University, the Ivy League leader, in their final game (after giving up 61 points to Cornell the week before). As they say, go figure. Not surprising that the University changed its coach in late November. 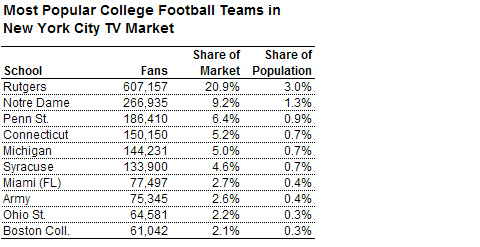 So New York college football seems inevitably mired in low interest and low appeal. The moral of this story: as great as that city is, if you want a real American college football experience, go just about anywhere but New York City. PS: I am not the only person who has noted the absence of competitive college football in New York City. Last year (2010) was the first game of the creatively named “Pinstripe Bowl” (don’t you love that name? ), which takes place at the new Yankee Stadium. And this year – December 30th – the Rutgers University Scarlet Knights (Big East) go up against the Iowa State University Cyclones (Big 12) at this event. The Pinstripe Bowl website proclaims the unusual fact that last year’s game was “the first college football bowl game played in the Bronx” since 1962 (American sports statistics are rich, are they not? ).